Your design portfolio, whether physical or online, is a crucial stepping-stone for your design career. It is the basis for branding and marketing yourself, the first brick in your pathway, and it is important to get it right! How your work is presented is just as important as having quality work to present. Do I need a physical portfolio? Do I need an online portfolio? Do I need both a physical portfolio and an online portfolio? An initial and necessary step to creating an attractive portfolio is to first plan it out. Make some thumbnails for how you want your portfolio to look and flow, and work from that. Do I want my projects zoomed in, presented in a series of smaller snippets, or full-size brilliant images? Your portfolio should display only your strengths, which is why it’s acceptable to pick and choose pieces from larger projects you’ve worked on. Do you like one part of the design, but not the whole? Just use that part in your portfolio. You’re creating a portfolio that’s professional, accessible, relatable, and stunning. Physical portfolios are wonderful in that they can be easily tailored for interviews with different jobs and companies. A clean and organized portfolio could have your projects displayed within clear sleeves, or shown throughout printed booklets with interchangeable pages. I’ve found printed books without interchangeability to be limiting for an active designer. Designers should be displaying their BEST work, which in most cases is always being updated and manipulated as we evolve our design skills. Therefore it is impractical (and expensive) to be constantly printing updated versions of your portfolio. A step beyond your main portfolio book could be something as simple as a small leave-behind booklet containing a few samples of projects that will be expanded upon within your main portfolio. These small booklets also give designers another creative outlet. They could be created in an assortment of ways including shape, size, folding technique, materials, etc. It’s important to make sure they are eye-catching, yet compact (don’t give it all away just yet). 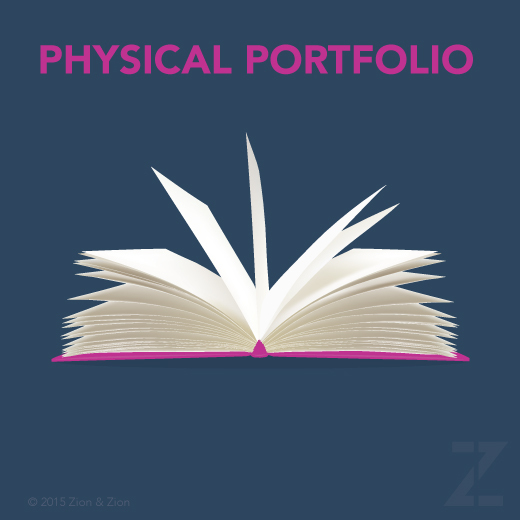 In your physical portfolio, it’s advised to display 12-15 projects. These pages should be tailored to the position or the company you’re interviewing for, although they should also cover a variety of projects and platforms. One key aspect of a printed portfolio is labeling your projects or numbering your pages; doing so ensures reviewers can return to previous projects for discussion. Make it clear and easy to navigate your work. Annotate your work throughout. Craig Steward, managing editor of Creative Bloq, wrote, “Illustrators and designers aren’t just employed for their style, but also for the clarity with which they interpret a creative brief. So if you include examples of your artwork without providing context, it’s impossible to judge.” Describe what was asked for, and demonstrate how you came to your final product. Your development process is a very relevant topic within portfolio reviews and can easily be shown in one or two projects. As mentioned above, your portfolio should only include your best work. Remember to go through it every few months and update your presented projects. Keep projects that are relevant and attention-grabbing. Also use projects that fall in line with your current direction of design in the present, not your past. Keep in mind, it’s absolutely acceptable to include some of your personal or non-client work. This is a great way to give more insight into who you are as a designer. 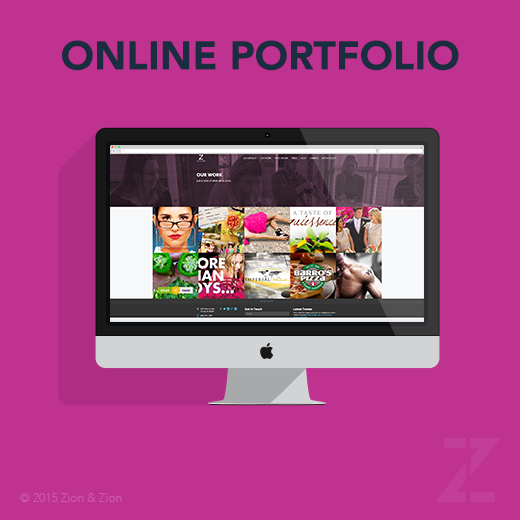 Today, employers are going to be looking for an online portfolio. Online portfolios are great tools that make it easy to display a multitude of work and are a necessity for designers. While there are some portfolio websites on the web that are built from the ground up, this may not be the best use of your time, unless you are looking for a career in coding and development. You may choose to build your site using templated sites such as WordPress.com or squarespace. Both of these sites are very user friendly and allow quick updating of your portfolio work. Online portfolios are a 24/7 viewing platform, and making them attractive and easy to navigate will help boost your online presence. Keep the design simple, accessible, convenient, and classy. Use an eye-catching logo or motif to make your site stand out. Try adding a tagline that succinctly explains what you do. Display prominent contact details so visitors have no doubt as to how they can email you, follow you on Twitter or connect on Facebook. Make it clear you want people to hire you (don’t assume they can read your mind). Sometimes you can’t beat a good ‘Hire Me’ button. Do your research and browse other portfolio sites. Bookmark any sites you enjoy, and those you don’t. This will allow you to better assess where you’re headed. Map out, just like your physical portfolio, how projects will be displayed. The square display module has proven to be very successful; an example of which is shown in the screenshot. Whatever style you choose, remember these five key points. They’ll help keep you on track! Where is the designer located? Can I view their work? What is this designer’s work history? How do I get in contact with this designer? What design work options are currently offered? What does this particular designer charge? “One of the biggest challenges is figuring out how to display printed material on screen,” describes New York-based designer Derek Chan. And this is absolutely true. Many designers, new and veteran, struggle with appropriately portraying their work, especially printed work. Always invest in some high quality photos of your work. This will help showcase your projects, and also boost your credibility. Promote yourself and your site. Share your portfolio on other social media and online platforms, such as Facebook, Twitter, Google Plus, Behance, Dribbble etc. Create a PDF that you can easily upload to LinkedIn and other sites. Adding an active and interesting blog to your website is another good idea. This will help in the promotion of your site by sending traffic your way, which is what you want. The more eyes on your work, the better. To make sure you’re doing it right, read up on content marketing. One addition not consistently mentioned is the inclusion of previous employment recommendations, written project evaluations, and client testimonials. Including these items in your portfolio can show how effective your work is and how well you can execute what is needed. Along with including recommendations, it is also helpful to include peer and employer reviews in your portfolio. Employers want to hire someone who is well rounded, experienced, and can work in various platforms. You should always demonstrate to employers your abilities—meeting deadlines, communicating clearly, participation skills, and thinking outside of the box. Don’t forget to market your brand and sell yourself. This is the opportunity to discuss other talents, hobbies, awards, distinctions, and triumphs as well. This section of your portfolio will allow you to set yourself apart from your competition. You are trying to catch employers’ eyes. With your portfolio, don’t overdo certain areas. If logos are your passion, and you could fill 20 project pages with nothing but logos, DON’T! Keep yourself from doing that! As a designer, you need to find the balance between satisfying the project spectrum needed in a quality portfolio and also leaving your reviewer wanting more. Make sure you’ve conveyed yourself in a way that keeps viewers interested and longing for more of your work. One, be able to speak with confidence about your work and deliver proper terminology and concise thoughts. If you have minor comments or nothing to expand upon during their review, the employer will blow you off. You need to “talk confidently and enthusiastically at the meeting, explaining the backstory and the journey you went through to get there,” describes Luke O’Neil, T3 magazine’s art editor. Couldn’t be truer. Secondly, be yourself. This is your time to shine—show off your work, be confident, explore your creativity, and let the world know you’re here to expand our society’s creativeness.